Bleeker, P. 1862-1877. Atlas Ichthiologique des Orientales Neerderlandais. 1-9. 420 pls., Amsterdam. Atlas ichthyologique des Orientales Neerderlandais, publie sous les auspices du couvernement colonial Neerlandais, Vol. 7. Amsterdam. Tokyo, 186 pp., 86 pls. Jordan, D. S. , S. Tanaka and J. O Snyder. 1913. A Catalogue of the Fishes of Japan. Jour. Coll. Sci., Tokyo Imp. Univ., 23(1), 492 pp. Randall, J. E. 1983. 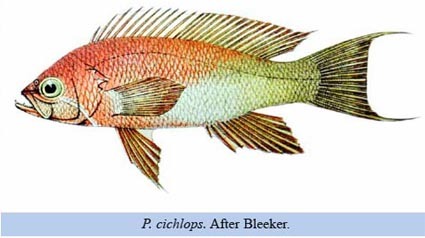 A new fish of the genus Anthias (Perciformes: Serramnidae) from the western Pacific, with notes on A. luzonensis. Freshwater and Marine Aquarium, 6(9): 27-37. Randall, J. E. and M. Humoto. 1988. 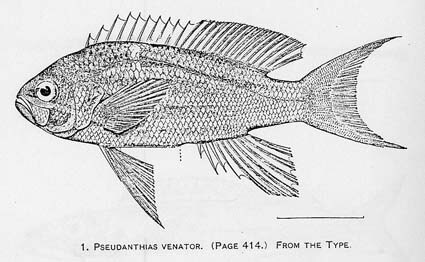 Redescription of the Indo-Pacific serranid fish Pseudanthias bimaculatus (Smith). Copeia, 1988(3): 669-673.
genus Pseudanthias from the South Pacific. Raffles Bull. Zool., 49(1): 19-34. 瀬能　宏．1990. ハナダイー最近の話題．I.O.P. Diving News, 2(1): 2-3. Snyder, J. O. 1911. Description of new genera and species of fishes from Japan and the Riu KIu Islands. Proc. U. S. Nat. Mus., 40(1836): 525-549. Snyder, J. O. 1912. Japanese shore fishes collected by the United States Bureau of Fisheries Steamer "Albatoros" expedition of 1906., Proc. U. S. Nat. Mus., 42(1909): 399-450, pls. 51-61.